NASA's newest lunar probe has officially begun its mission to study the moon's tenuous atmosphere like never before, as well as track how dust moves across the lunar sky. The Lunar Atmosphere and Dust Environment Explorer, nicknamed LADEE for short, entered its science orbit on Wednesday (Nov. 20). The spacecraft now circles the moon once every two hours in an orbit, approaching within a mere 8 miles (12 kilometers) at its closest point and soaring 37 miles (60 km) overhead at its highest point, NASA officials said in a statement. A NASA video captured the moon mission milestone as LADEE bgean its science mission. "A thorough understanding of the characteristics of our lunar neighbor will help researchers understand other small bodies in the solar system, such as asteroids, Mercury, and the moons of outer planets," said LADEE program scientist Sarah Noble, at NASA Headquarters in Washington, in a statement Thursday (Nov. 21). LADEE's orbit carries the car-size spacecraft around the moon's equator, allowing the probe repeatedly see the moon during lunar day and night. 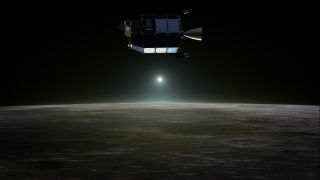 Scientists hope it will be able to see strange, glowing "rays and streamers" in the moon's atmosphere that were first seen in early unmanned lunar photographs and reports from Apollo lunar landing astronauts. The spacecraft also carries a novel laser communications system to test high-speed data transmission technology for future space missions. The LADEE spacecraft's low orbit around the moon requires meticulous attention to keep the probe from falling victim to the strange, lumpy lunar gravity. "Due to the lumpiness of the moon's gravitational field, LADEE's orbit requires significant maintenance activity with maneuvers taking place as often as every three to five days, or as infrequently as once every two weeks," said Butler Hine, LADEE project manager at NASA's Ames Research Center in Moffett Field, Calif., said in a statement. "LADEE will perform regular orbital maintenance maneuvers to keep the spacecraft’s altitude within a safe range above the surface that maximizes the science return."